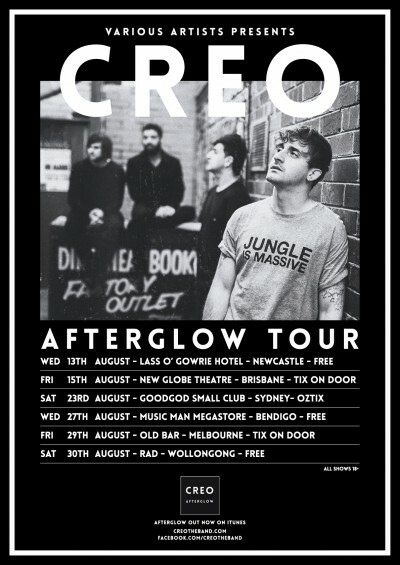 Sydney’s CREO have just released their brand new single ‘Afterglow’, and are heading back to the Danceteria to celebrate! Sporting a get-your-feet moving rhythm section, layers upon layers of oozing guitars, and a chorus soaked in that signature vocal sound that is guaranteed to incept your mind for weeks, ‘Afterglow’ is another promising sign this young band has the material to back up their hard work ethic. Since forming in 2012 they’ve received plenty of nods from folks like TheMusic, Beat Magazine (Single of the Week) and more recently Video Feature for “Afterglow” on Triple J Unearthed. For their Goodgod show, they’re joined by Melbourne quartet Them Bruins, and Brother James (ex-Vasco Era).